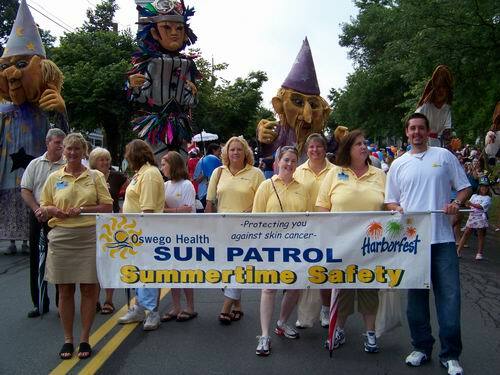 The 2010 Harborfest Children's Parade sponsored by Oswego Health takes place Friday, July 23 beginning at 11 AM. Pre-Parade festivities begin at 10 AM. Once again this year, Oswego Health has thrown its support behind the Harborfest Childrenâ€™s Parade.Â This yearâ€™s parade will take place Friday, July 23 beginning at 11 AM. The 2010 Childrenâ€™s Parade will once again start at East Park with pre-parade festivities beginning at 10 AM on the Jazz & Blues Stage and again will be hosted by Joe Trionfero. The Sun Patrol was started more than 20 years ago by Nurse Practitioners Nancy Dowd and Brenda LaMay after several young children came to the Oswego Hospital emergency room with severe sun burns following Oswegoâ€™s Independence Day Parade. Since then, Oswego Healthâ€™s Sun Patrol has handed out countless packets of sunscreen during Harborfest and other community events. Harborfest invites children of all ages to participate in our annual Childrenâ€™s Parade, which will incorporate this yearâ€™s Harborfest Cultural Component â€œFranceâ€.Â Pre-Parade workshops will again take place at the Breitbeck Pavillion July 21 from 13-4 PM and 6-7 PM; and July 22 from 10-11 AM and 12-1 PM.Â There will also be post-parade workshops at the Novelis Family Park at Fort Ontario July 23 & 24 from 11 AM-5 PM. The Parade will begin in East Park at 11 AM on Friday, July 22 and parade to the Novelis Family Park at Fort Ontario. Oswego Healthcare system includes the Oswego Hospital, The Manor at Seneca Hill, a skilled nursing facility; Springside at Seneca Hill, a retirement living community; an urgent care center in Fulton, as well as health services centers in Mexico, Parish and Phoenix. For more information, call (315) 349-5500 or visit oswegohealth.org. The 2010 Harborfest Childrenâ€™s Gala will be held Tuesday, July 20 from 6 PM-8 PM at Historic Fort Ontario.Â Tickets are just $5/person and are available at the Harborfest offices in the McCrobie Building in Oswego. Slated for July 22-25, the 2010 edition of Harborfest will feature plenty of food, fun and entertainment as venues on both Oswegoâ€™s east and west sides will be used to deliver the excitement. A wide variety of entertainment will be featured on stages throughout the city of Oswego including, the Jazz & Blues Stage in East Park, the Veteranâ€™s Stage on West River Walk, the Family Stage at the Novelis Family Park at Fort Ontario and the NRG Lakeview Stage in Breitbeck Park.